The Brit Hotel Golfhotel has 50 rooms in 3 categories. Choose amoung our rooms : double room, twin comfort ortriple standard . We also have 2 rooms for disabled guests . 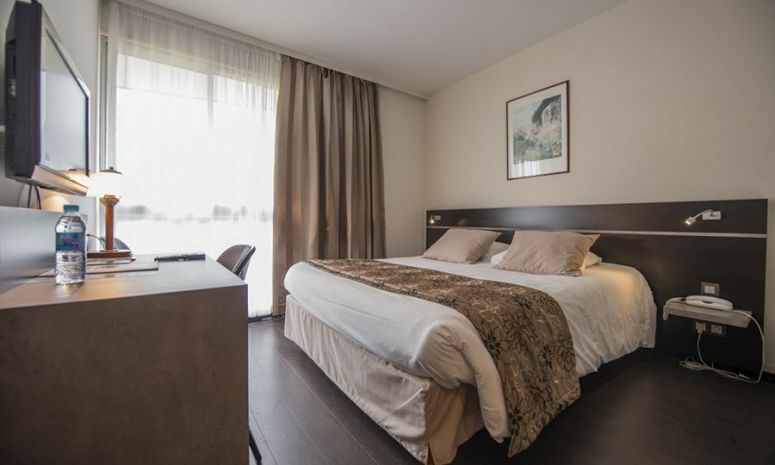 During your stay in our hotel , enjoy the many amenities found in your room : flat screen TV with Canal Plus Sports et Cinéma, phone, WiFi connection, private bathroom... Everything is done to Brit has for you you feel " at home "! -Cancellable reservation : Reservations must be cancelled 24 hours in advance to avoid charges (except for special reservation conditions). Charges are one night deposit. To guarantee your reservation, we require a credit card number and the expiration date. No amount will be taken by Brit-Hotel. The payment is directly made with the hotel after your stay. Please call the place if you expect to arrive after 6.30 PM. * In low season, the restaurant can occasionally be closed. I have left a review on booking.com - but to summarise:- Most of the staff were very friendly and helpful - which was appreciated - though there was 1 person in the bar that came across as quite miserable and began to upset us - it seemed that everything we asked for was too much trouble. It would have been nice to know about the swimming instructor and the restrictions therefore on the swimming pool. Something I think you should mention in your publicity. We did think that as you advertised a tennis court that you would be able to provide tennis balls and rackets - that seemed odd that you didn't. Some more communal seating would have been appreciated. Just somewhere to sit and read a book and relax. I realise that you probably cater for the "golfing" community - and they probably get a different experience. But those that weren't there to play golf I do feel have been slightly overlooked. Excellent staff looked after our group of 45 with great enthusiasm and professionalism , everyone was delighted with the hotel. Nice place, nice location. I would recommend it to my friends.